Every couple of years the Belgians feel compelled to pronounce it the Year of Something: a few years ago Brussels was the capital of fashion and design, after that it was the year of the comic strip. This time around the government has declared it a year focused on something I have a particular fondness for: gastronomy. Welcome to the appropriately named Brusselicious. Land of lambics, waffles, and moules frites, the country has a few surprises up its sleeve, too. Like Brusselicious XXL, an exhibition of some 35 monumental sculptures of iconic Belgian foods (sprouts, natch) scattered throughout the city. And the Tram Experience, a two-hour trip aboard a liveried city tram, which takes in the sights as you wine and dine on a menu concocted by a rising chef with a fondness for classic Belgian cuisine. (Carbonnade, anyone?) In the works are chocolate-themed weeks, picnics in the parks, and many a chipstand crawl, but the event that has me licking my lips while looking for the seatbelt is 140-feet up in the air. 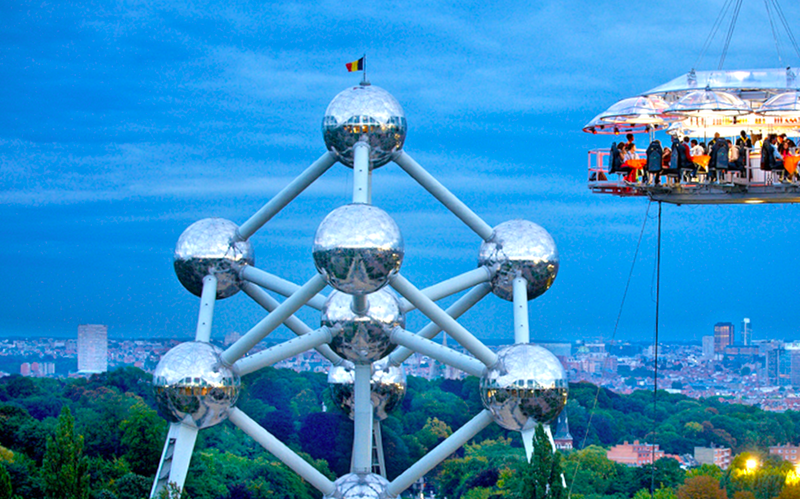 In a city known for its Surrealist bent, a series of Dinners in the Sky are the ultimate culinary dream. Already successfully staged in Las Vegas, Sao Paolo, and Sydney, 22 guests and one starred-chef will experience “high cuisine” while dangling over the capital.